Hey everyone! Today, I have the absolutely gorgeous Zoya Enchanted Holiday Collection to show you! Described as a whimsical color-flip metallic with a periwinkle base with a magenta flip. You all know I love periwinkle and I love magenta, so I feel this is my soul polish. I sat and stared at this one for a very long time. I will love this one for winter, spring, summer, AND fall. The first coat was sheer, but it built up very well on the second coat. My swatch is shown in just two coats. Described as a captivating periwinkle pixie with magenta and blue sparkles in the exclusive Zoya PixieDust Matte Sparkle formula. I do not own a PixieDust similar to this one and I own all of the PixieDusts. 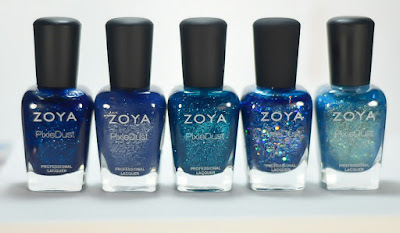 However, Zoya Nyx is also described as periwinkle, but they don't look even look close in comparison. This one is so incredibly beautiful. Did I tell you I love periwinkle? My swatch is shown in two easy coats without top coat. 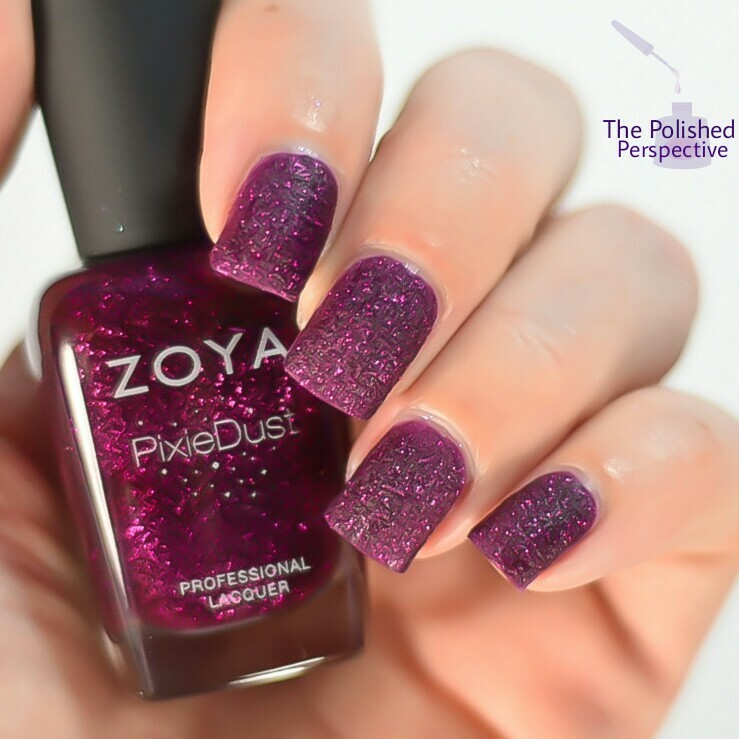 Described as a luscious berry with sugary sparkle in the exclusive Zoya PixieDust Matte Sparkle formula. Another pretty PixieDust! My swatch is shown in two easy coats without top coat. Here's a comparison with other similar Pixies. From left to right: Lorna, Noir, Carter, Thea, Arabella. Lorna is only similar in color to Noir. 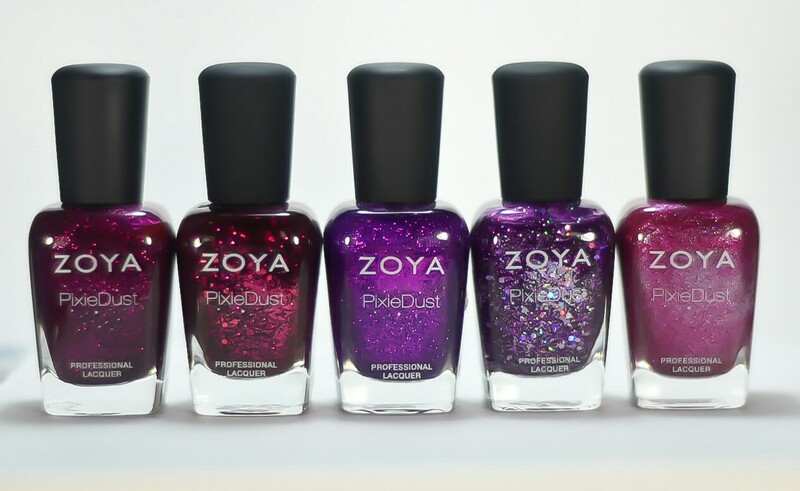 However, Noir is a Magical PixieDust, which means it has the bigger glitters. Lorna is like the original Pixies with small glitters. Side note: I really love the Magical Pixies and I hope they release a few more of these. 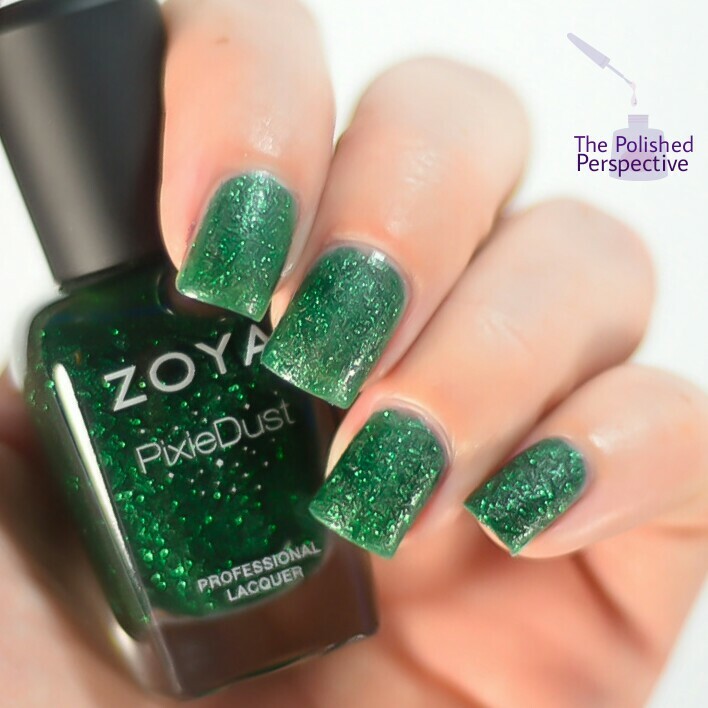 Described as a bewitching emerald green with a sugary green sparkle in the exclusive Zoya PixieDust Matte formula. This really is a perfect jewel toned emerald green. My swatch is shown in two easy coats without top coat. From left to right: Elphie, Chita, Cece. I didn't include Vespa because it's more of a pastel green PixieDust and in no way similar in color. 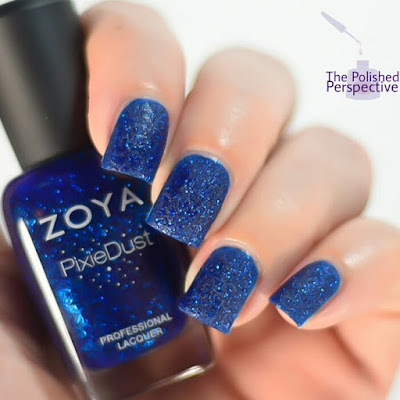 Described as a brilliantly deep sapphire blue with blue sparkles in the exclusive Zoya PixieDust Matte Sparkle formula. This one is such a bright jewel toned blue! My swatch is shown in two easy coats without top coat. From left to right: Waverly, Sunshine, Liberty, Nori, Bay. I really thought Waverly and Liberty were going to be similar, but they're two completely different blues. 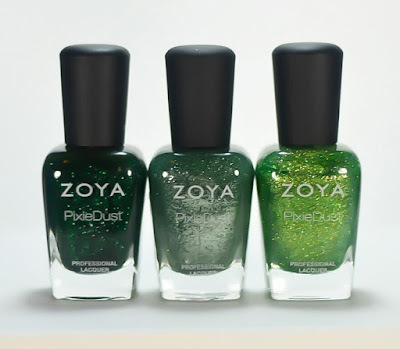 Waverly seems really close to Nori, but Nori is a Magical PixieDust with large glitters. 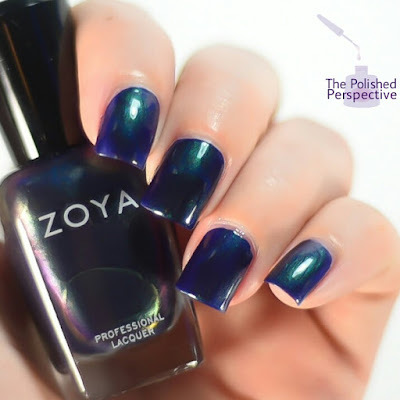 Described as a spellbinding color-flip metallic with an indigo base and a green and purple shift. Okay. This one really is spellbinding. 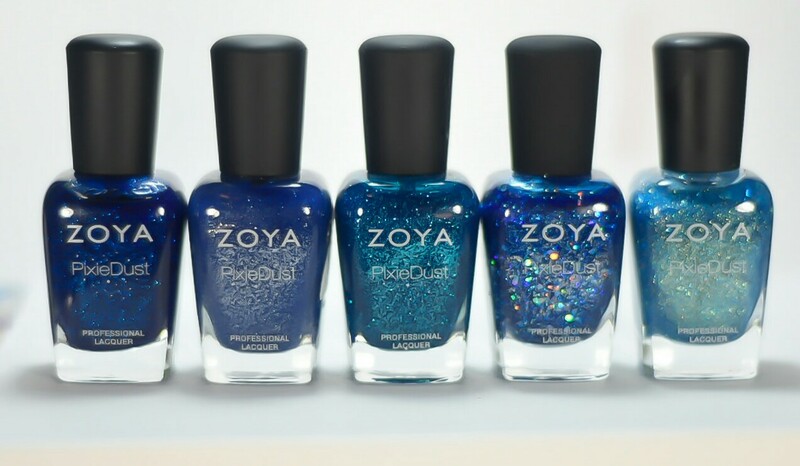 I really hope Zoya continues to do these color-flips and shifts because they are just so incredibly beautiful. My swatch is shown in one easy coat. I immediately swiped this one on my thumb when I received my package and it did stain. For my formal swatch, I used a basecoat and made sure to remove this carefully and I did not experience any staining through the basecoat. I feel like this collection is as enchanting as the title implies. These are all gorgeous shades and the formulas are great. 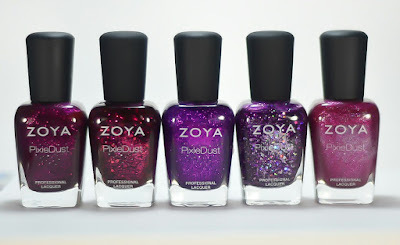 Like I said earlier, I really, really hope Zoya continues to produce these amazing color-flips and shifts. 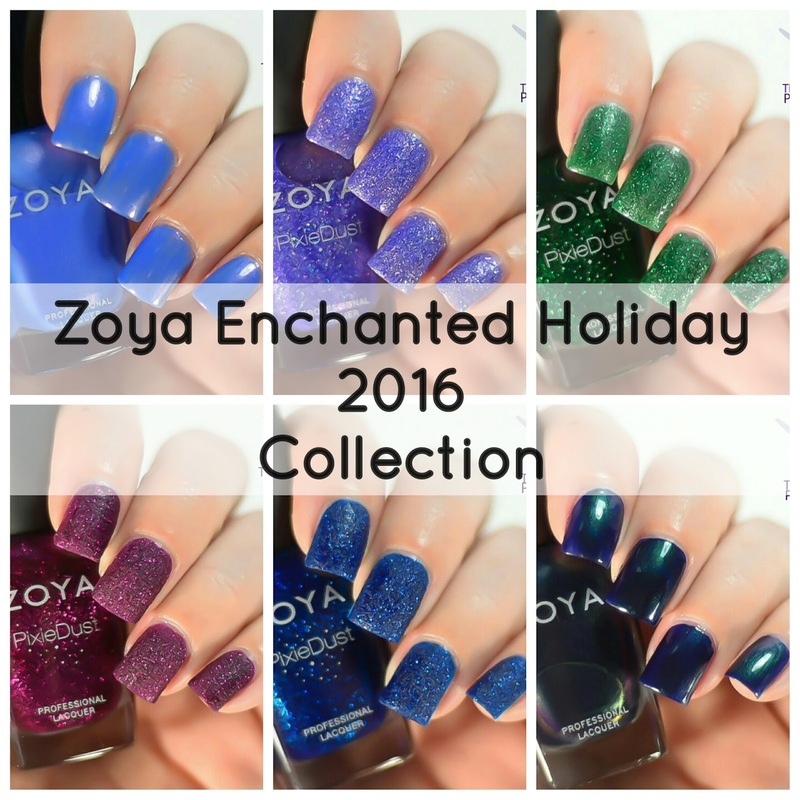 The Zoya Enchanted Winter Holiday 2016 is available now on Zoya.com. What do you think of this collection? Let me know in the comments! I'm looking forward to Olivera. Your bottle comparisons were a nice touch! I always wonder how things compare. Gorgeous! I'm trying to play more for Halloween before I jump into using these, but this post makes it hard! So pretty! I like Saint and Olivera best! Zoya Saint is the clear winner of the collection! I have these on my desk waiting to play with them but I already wore Saint! I love this collection so much! Oliveria and Lorna are my favs. This collection was so well done!